Recorded and processed at 24-Bit / 96Khz at our famous British Studio through a large custom NEVE desk. 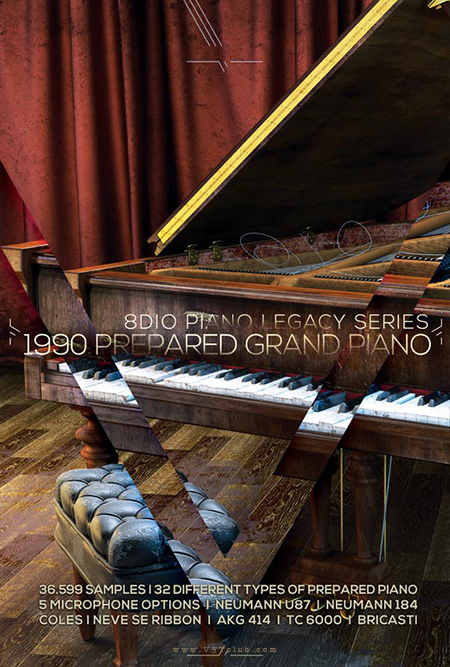 The 1901 Upright Studio Piano contains both standard and prepared articulations. All standard sustain samples were recorded with both pedal up, pedal down and half pedal positions. In addition we also added staccatissimo (w/ round robin) for fast playing styles and our gorgeous Una Corta (Soft Pedal) articulation, which has to be the warmest- and softest piano articulation ever recorded. The 1901 Upright Studio Piano also contains a large selection of prepared articulation, which is included in the library too. The upright piano techniques includes plucking the strings with various instruments, to muted articulations & unique playing styles. In addition the library gives you full control over the dynamic response as well as mechanics and tonal qualities, so you can dial in the perfect sound for your workflow. We included full control over resonance, room tone, non tonal key control & unique release triggers for hammer action, string damping, and release triggers for our more ambient microphones. The library includes 6 different type of microphones, including Neumann 87′s, Coles, Neve SE Ribbon’s, AKG 414′s, Neumann KM 184′s and a mixed microphone position, which was made by combining all 24 microphones used in the sessions. We also recorded all samples through two world-class reverbs (Bricasti and TCElectronics 6000), so you have the best microphones and reverbs right at your finger tips. Lastly we recorded everything through a Studer A820 Tape-Deck (and yes – we use real tape – not just emulations), so you can either choose to play the samples in their digital form or hear them through the Studer A820, which provides a very unique feeling and authentic vintage feel to the samples. The 1901 Upright Studio Piano is best described as an incredible warm, cinematic and emotive experience. 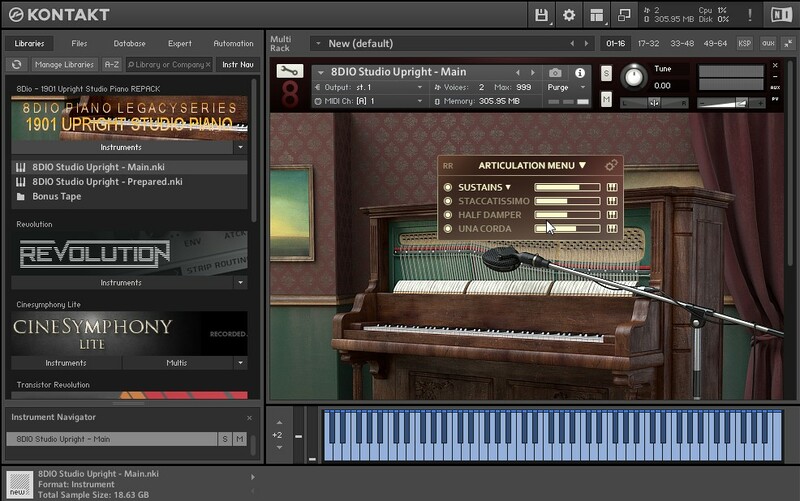 Piano from 8Dio. Features repack: all samples (more than 40 thousand pieces) are packed in containers and sorted into folders. You can select and remove unnecessary microphones. Contact 5.5.0.